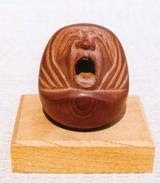 This BLOG of the Virtual Daruma Museum is for educational puropses only. Its aim is to tell people about Japan and its culture via the medium of Daruma san. This blog relies heavily on information and images found in public domains whilst searching the Internet with YAHOO and GOOGLE. I consider this material officially published, like in a book, and will use it as a reference to illustrate my explanations about Daruma San, Fudo-sama and other topics of Japanese Culture. Since good material tends to disappear again from the internet, I take the liberty to quote extensively. When material is copied I give credit to the source directly below the item or at the end of the paragraph. With some material from online auctions it is difficult quote photos as a proper link, because they are online only a few days. If you feel that your material is thus not properly quoted, please contact me. This material is used here only for display in a virtual museum, to keep important and special items with Daruma san collected in one spot for the sake of Daruma lovers all over the world. It is not used for any harmful purpose. Your contributions are always greatly appreciated. If you feel that your work has been improperly reproduced here, or misrepresented in any way, or should you feel that I have infringed on your copyright, I kindly ask that you contact me directly with your requests. If I have mistakenly omitted a credit, or given an incorrect credit, please e-mail so I can fix it or remove it from this site. Für das Zitieren elektronischer Dokumente im Internet existieren internationale Richtlinien, die ISO-Norm 690-2. Demnach darf bei einer Quellenangabe für elektronische Dokumente im Internet die URL und das Datum des Abrufs der Informationen nicht fehlen.